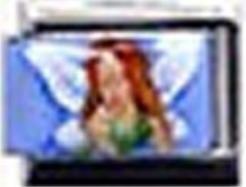 Description: This green Moni Originals fairy is a charming addition to any 9mm Italian charm bracelet! Painted on a sky-blue background, she has long, wavy auburn hair. Additional Information: Moni Says: Remember, I can customize colors to suit your needs. Just ask!